A brachial plexus injury occurs when the nerves that connect your spine to your arm and hand are damaged. When this injury occurs during childbirth, the result is usually Erb’s palsy, which affects the nerves between the shoulder and the elbow, or Klumpke’s palsy, which affects the nerves in the hand. Depending on the severity of the injury, a victim may never regain full mobility. At Paulson & Nace, PLLC, we help families just like yours handle the aftermath of serious birth injuries such as those affecting the brachial plexus nerve network. For the last four decades, we have fought for families throughout Washington, D.C. securing millions of dollars in compensation for their injured children. Neuropraxia, or stretch. Neuropraxia injuries are the most common and the least severe. They occur when the nerve has been injured in some way, but it has not torn. Most neuropraxia injuries will heal themselves, though it is possible – in about 10% of cases – they will not. A child with a neuropraxia injury may need some therapy. Neuroma. Neuroma injuries are tears that have healed themselves, like neuropraxias, but the scar tissue is pressing on the nerve. The scarring prevents the child’s muscles from receiving any signals from the nerves themselves. Some neuromas will heal themselves; others may require physical therapy or even surgery to correct. Rupture. A rupture of the brachial plexus nerve occurs when the nerve itself tears. It remains attached to the spinal column. The only cure is surgical. Avulsion. Avulsion injuries are the most severe; this is when the nerve has been torn from the spinal column. Without surgery, the affected arm may be paralyzed in some manner for the rest of the child’s life. Each and every category may require additional medical help in order for your child to regain the full use of his or her shoulder, arm or wrist, including weeks or months of physical therapy and/or surgical procedures. Unlike cerebral palsy, which may take years to manifest, Erb’s palsy and Klumpke’s palsy are both immediately apparent in newborns. It is crucial that the doctor determine which type of brachial plexus injury your child has sustained as quickly as possible, before too much time passes for the injury to be fixed. Paulson & Nace understands how devastating these injuries can be for both your child and your family. We hold negligent doctors responsible when their errors – such as delaying a necessary C-section, or using excessive force while trying to deliver the baby – have long-term or even permanent repercussions. If your child was the victim of negligent medical care, we want to hear your story. 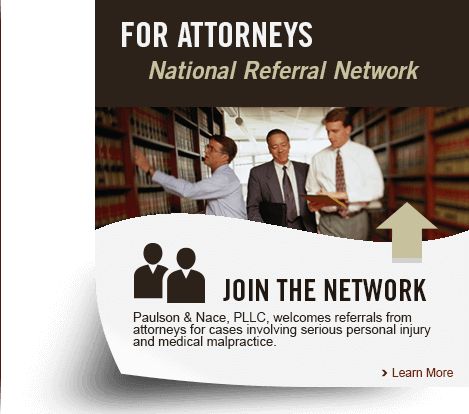 Paulson & Nace, PLLC, creates options for families whose children have suffered a brachial plexus injury. The statutes of limitations in Washington, D.C. do not give you much time to file a claim, so it is important that you speak to a medical malpractice attorney as quickly as possible. Please call 202-930-0292 or fill out our contact form to schedule a free initial consultation with one of our dedicated lawyers.